Concrete, stone, and brick are designed to stand the test of time, and we think your lighting should do the same. DEKOR® is proud to be born and bred in the scenic state of Colorado. When our very own CU Buffs approached us with a groundbreaking custom lighting project, we couldn’t wait to start. The University of Colorado-Boulder is a renowned university, with a budding athletics program that deserved its time to shine. By creating an illuminated and dimensional logo of the CU emblem, we brought the CU brand into the limelight. But what was the key to this shining symbol? DEKOR® LED Paver Dots™. By strategically planning the paver lights setup, expertly installing into the concrete roofing, and simply connecting with Plug-N-Play™ technology, the custom CU logo was dreamed and delivered. Shining like a beacon overlooking Folsom Field, our illuminating creation is a spotlight of the Boulder campus, instilling pride and recognition for all to see. When the sun sets in the middle of a thrilling Buffs football game or practice, the iconic CU logo comes to life, lighting the way to a winning season. Our exclusive collection of driveway lights, LED patio lights, and LED paver lights are built to last. With a deeper housing than our classic recessed lights, our LED PAVER DOT™ lights are composed of a polycarbonate housing and lens. This premium polycarbonate housing in our paver lights and concrete lights is pound-for-pound stronger than the toughest aluminum. Used in engineering hardware, construction materials, safety goggles, and even jet fighter cockpit canopies, polycarbonate is an unrivaled source of strength and durability in every market. 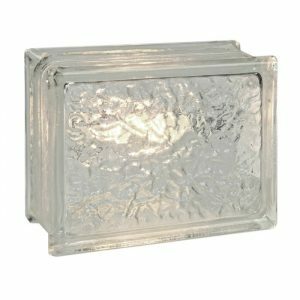 Or, choose our PAVER-LITE Paver Block Lights for a seamless driveway light integration into 6” x 9” pavers, with a .25” thick molded glass that stands up to daily vehicle traffic. 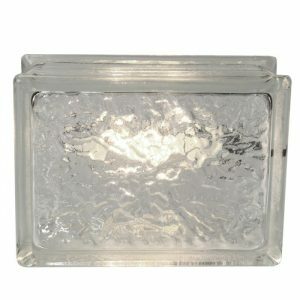 With a rated 600 PSI, these impervious driveway light blocks have the strength to shine through it all. DEKOR® PAVER DOT™ concrete and paver lights are designed to be tough in construction, but easy in installation. Follow our step-by-step instructions to install your LED paver lights perfectly flush into concrete, creating a seamless surface in minutes. 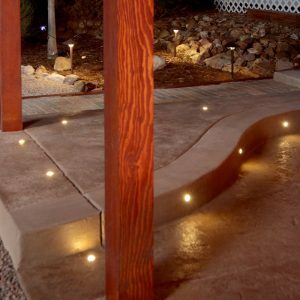 Once installed, your LED concrete lights come to life with our patented Plug-N-Play™ technology. 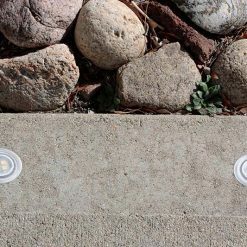 To create a dimensional path of lights on your driveway, patio, or pavers, simply connect each PAVER DOT™ component to its successor with our male-to-male cables. Choose from our 5 foot paver light cables if you plan on a more condensed path, or our 10 foot cables for a subtle and spaced out design. With DEKOR®’s customized collection of paver lights, driveway lights, concrete lights, and LED patio lights, there’s always an illuminating solution fit for you. DEKOR®’s integrated collection of paver lights gives you the power to have a lasting, durable shine without breaking the bank. With our exclusive partnership with CREE LEDs, we have access to the latest breakthroughs in LED technology. Constantly increasing efficiency while maintaining shine is our top goal, which is why we offer our NexGen LED upgrade with each product. NexGen LEDs increase brightness by 300% without increasing energy usage, ensuring your electric bills don’t surge or spike. No matter what shine you select, our EZ Photocell Timer allows you to cut down your energy usage even further. Giving you the power to set your lighting from dusk-to-dawn, your paver lights, LED patio lights, or driveway lights will only shine once the sun is set. That way, you don’t have to bother adjusting your lighting day-to-day—let the Photocell sensor set the shine and save you big. When our innovative collection of LED PAVER DOT™ Lights first arrived, many of our beloved customers found an illuminating solution to their dark driveways, pavers, and patios. However, we found a greater need beyond concrete and brick surfaces—it was time to step up our LED paver lights and driveway lights. By introducing the versatile Step & Stair PAVER DOT™ Kit as a perfect addition to the classic PAVER DOT™ paver lights kit, we gave our customers a complete hardscape lighting experience. Outdoor stairs and steps are always in dire need of illumination and ambiance, lighting the way to safety and providing a sense of direction. By adapting our classic LED paver lights for stair setting, we flipped our robust housing on its head. Adjusting the lighting to a precise 30° angle for illuminating hardscape stairs and steps, our Step & Stair PAVER DOT™ paver lights provides an accented shine for every step. "Just wanted to let you know how much I loved your product. Your recessed lights were exactly what I was looking for and was pleasantly surprised that they were better than advertised. They look and work great. My only wish is that I had found your company sooner as I had already ordered my other exterior light. But next time – next job. Thanks again!" 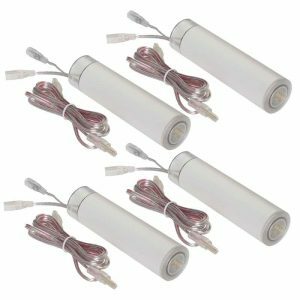 "Thanks for the great product – we installed over 80 lights into the soffits of our new home and they are simply AWESOME!" "I have installed almost half of my lights and I am very pleased with the results. The installation has been very simple in my deck rails. 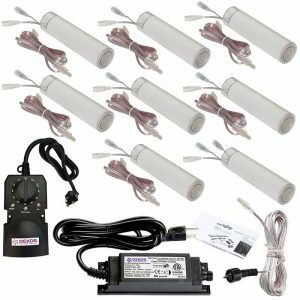 I did a lot of research and compared several similar products and I am very glad I chose your lights. You can use me as a sales reference at any time." All PAVER DOT™ paver lights, driveway lights, and LED patio lights are protected for 10 years under our competitive warranty. Our trusted warranty protects the PAVER DOT™ paver light, Step & Stair, and PAVER-LITE Paver Block Light. All PAVERDOT™ paver lights, driveway lights, and LED patio lights are protected for 10 years under our competitive warranty. Our trusted warranty protects the PAVERDOT™ paver light, Step & Stair, and PAVER-LITE Paver Block Light.